CRAB MEAT or crabmeat is the meat found within a crab. It is used in many cuisines across the world, prized for its soft, delicate, sweet taste. Brown crab (Cancer pagurus), blue crabs (Callinectes sapidus), blue swimming crabs (Portunus pelagicus), red swimming crabs (Portunus haanii) are among the most commercially available species of crabmeat globally. In some fisheries, crab meat is harvested by declawing of crabs. This is the process whereby one or both claws of a live crab are manually pulled off and the animal is then returned to the water. The practice is defended because some crabs can naturally autotomise (shed) limbs and then about a year later after a series of moults, regenerate these limbs. It is argued that declawing therefore provides a sustainable fishery, however, declawing can lead to 47% mortality and negative effects on feeding behaviour. Furthermore, once separated from the body, the claws will start to degenerate. Usually, crabs are cooked moments after capture to ensure freshness; the freshness of claws previously removed from the crab cannot be accurately gauged and should therefore be avoided. SEAFOOD is any form of sea life regarded as food by humans. Seafood prominently includes fish and shellfish. 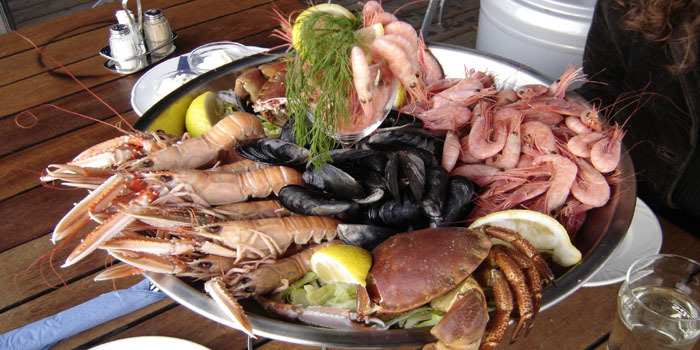 Shellfish include various species of molluscs, crustaceans, and echinoderms. Historically, sea mammals such as whales and dolphins have been consumed as food, though that happens to a lesser extent these days. Edible sea plants, such as some seaweeds and microalgae, are widely eaten as seafood around the world, especially in Asia (see the category of sea vegetables). In North America, although not generally in the United Kingdom, the term "seafood" is extended to fresh water organisms eaten by humans, so all edible aquatic life may be referred to as seafood. For the sake of completeness, this article includes all edible aquatic life. Now Millennials Are Being Accused of Killing Canned Tuna - TIME Magazine. Sushi king pays record $3.1m for endangered bluefin tuna in Japan - "The winning auction bid for the enormous tuna was more than double the price fetched five years ago." Welcome to the crab capital of the world - "Welcome to Sapporo, crab capital of Japan (and maybe even the world)." Blue Star Food - "Blue Star has been proudly processing, packaging and selling pasteurized Blue Crab meat in the US since 1995. Our products are currently sold in The United States, Mexico, Canada, The Caribbean, UK, France, Singapore & Hong Kong." CHARLESTON SEAFOOD at Amazon's Grocery & Gourmet Food - 80 results as of October 5, 2017. Balik - "Specialities from the sea." 9 products. Citarella - since 1912. "The Seafood Authority." We go crazy for crab! Joe’s favorite soft-shell crabs bump claws with local Maryland blue. Cleaned and ready for your next Cajun Crab Boil, or just serve ‘em up with a little melted butter and lemons. Our shelled crab meat is fresh from the East Coast, cooked up ready for crabcakes, cheesy dips, or a lovely salad garnish. With a reputation built on more than 100 years of culinary excellence, Citarella is proud to offer you the best seafood, prime meats, and gourmet foods. CLEARWATER - since 1976. "Dedicated to Sustainable Seafood Excellence." Clearwater Snow Crab comes from the clear cold waters of the North Atlantic Ocean. They are harvested from early May to mid-September. COLCHESTER OYSTER FISHERY - "Suppliers of the Finest Seafood." CRAB MEAT AT AMAZON.COM'S AT GROCERY & GOURMET FOOD - 427 results as of October 5, 2017. CRAWFISH AT AMAZON.COM'S AT GROCERY & GOURMET FOOD - 317 results as of October 5, 2017. Fine Food Specialist - since 2012. "Buy Fine Foods & Specialty Items." Seafood has long been a staple ingredient for gourmands, chefs and devoted foodies across the globe and here at Fine Food Specialist we share this culinary passion. Our wonderfully diverse and abundant range of fresh fish, cured and smoked fish, shellfish, sashimi and more is of the finest quality and variety. Sourced from local waters and across the globe, our spectacular selection offers something to suit every occasion and budget so enjoy browsing from our seafood category then simply take your pick from our staggering choice. Harvest Meat Company - "Harvest Food Distributors searches the world for the freshest and most consistent quality seafood. So, when you are looking for wild caught, farm raised, domestic, imported or value added, Harvest is your source for great seafood." Island Seafoods - Alaska crab. "Island Seafoods offers high quality Bristol Bay Red King Crab, Snow Crab, and Dungeness Crab from the clear, cold waters of Alaska’s Bristol Bay." P & G Trading Company - "Distributors of the World's Finest Seafood." Crab meat. pontchartrain blue crab - since 1996. "Dedicated to processing premium-quality blue crab meat." SEAFOOD AT AMAZON.COM'S AT GROCERY & GOURMET FOOD - 12,727 results as of October 5, 2017. The Crab Place - since 1997. "Fresh Maryland Crab Meat." W. Harvey & Sons - "Cornish Handpicked Shellfish Since 1955."